One of the most fascinating cities in Armenia is the town of Meghri. Situated on the Iranian frontier 230 miles away from Yerevan, in the southern extremity of Armenia’s historic Syunik province, Meghri is a town of 4,600 people. It can take several hours to reach Meghri, at least six if traveling by taxi and more if one opts to travel via marshrutka. The road crosses through very mountainous terrain but provides some incredible vistas. Indeed, the mountains and the elevations become much higher the further south you travel in Armenia. Traveling to Meghri this summer with fellow Abovyan Group contributor Lilit Grigoryan, we observed that the clouds were almost touching the mountains. It also got very chilly. Then we descended into a very fertile valley. The temperature became warmer and subtropical. The scenery changed from forest to a more arid environment. Entering Meghri, we drove into the city center. The city was small, built on a heights with narrow streets. The quaint city square had trees and a fountain. In general, despite the hot climate and the arid surroundings the city itself had a lot of trees and was very green. It reminded me of a town that one might find in Latin America or Sicily. The name “Meghri” is derived from the Armenian “meghr” (“մեղր”) meaning “honey,” a toponym that stems from the fact that Meghri is a city located in a fertile valley where many kinds of fruit and vegetables are grown. Walking along the streets, one comes across grapes, walnuts, and pomegranates. In fact, Meghri is one of the few places in Armenia where one can find the pomegranate, considered to be one of the country’s national symbols. Fruit cultivation is not the only major part of Meghri’s economy. The city also benefits from border trade with Iran and many people are also employed by the Russians, who guard the border jointly with the Armenians. A local informed us that unemployment in Meghri was low. Indeed, the city seemed to be doing relatively well. Notably, the population has remained stable. Map of Armenia and the Nagorny Karabakh Republic (NKR) highlighting the location of Meghri. Due to its remote location, Meghri does not see many tourists. Those who do come often go to see the Iranian border and the Araks River from Agarak, which, admittedly, is an adventure in and of itself. Yet, aside from this, Meghri has much history behind it. 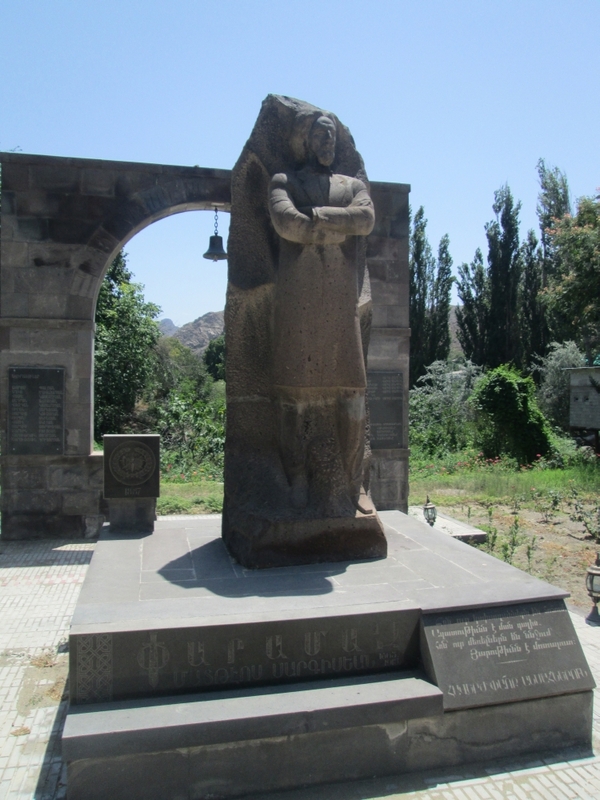 There are many historical sites in the city and its vicinity, including a mountain fortress where Davit Bek, the legendary Armenian hero of Syunik, held off the Persians and the Turks in the 18th century. “It will take you an entire day or maybe two to explore all the historic sites of Meghri,” a local waitress told us at a restaurant in the city. From this same restaurant, we also saw the Meghri River and the statue of Matteos Sargsyan (better known as Paramaz), Meghri’s Hunchak hero from the late 19th and early 20th centuries. During the 1905 Russian Revolution, Paramaz sought to promote peaceful ties between Armenians and Tatars (modern Azerbaijanis) in the region. He was also active in revolutionary activity in the Ottoman Empire. At a Hunchak conference in Constanța, Romania, he and others sought to organize the assassinations of the Young Turk leaders responsible for the 1909 Adana Massacre. However, through the efforts of a Dashnak spy, he was arrested by the Turks and was hanged in Constantinople in 1915. There are three churches in Meghri that are unique to Armenia. They are St. Hovhannes, St. Astvatsatsin, and St. Sarkis. Meghri’s churches are distinguished in Armenia for their brick exteriors and their elaborate interiors covered in old Persian-style frescoes (unusual as Armenians typically do not decorate their churches with such frescoes). The most stunning was perhaps the magnificent 17th century St. Sarkis Golgotha Church (so named because like Golgotha, it is located on a hill overlooking the city). It was slightly inaccessible. Few tourists visit it and we had to climb up the hill in order to reach it.